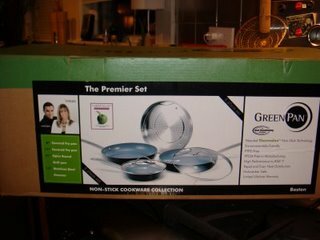 Back when Linens -n- Things had their going out of business sale, the Husband and I stopped in on one of the final days and scored two sets of Green Pan non-stick cookware. We had been wanting to get rid of our cancer-causing Teflon cookware for a while and at 50% off the original price, we couldn’t resist. We got the set below and then another set that has a stock pot, grill pan, another small skillet, a saute pan — SORT of like the second photo below, but with two additional lidded pots. Traditional non-stick pans contain PTFE, are manufactured with PFOA and are limited in heat resistance — only up to 260 degrees C / 500 degrees F. PTFE can’t be heated above these temperatures without damaging it. When surpassing this limit, toxic fumes harmful for the human respiratory tract might be released. These fumes are even lethal to small pets, like birds. During the manufacturing of conventional PTFE based non-stick fry pans, PFOA is used and emitted into the environment. This is a persistent chemical that, according to the Environmental Protection Agency (EPA), can be considered as a “likely human carcinogen”. PFOA can be found in numerous living organisms, even the human body. Studies show that 95% of the population carry PFOA in their blood, recently scientists have found proof that this chemical even passed to babies through mother’s milk. 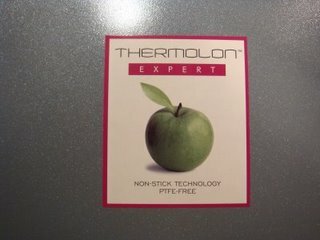 Knowing that GreenPan (TM) with Thermolon (TM) does not use or contain these chemicals, it clearly offers the consumer a healthier, safer and more environmentally friendly cookware. Compared with the production of PTFE based non-stick fry pans, our technology allow us to reduce the carbon emissions during the application of the coating by 60%! 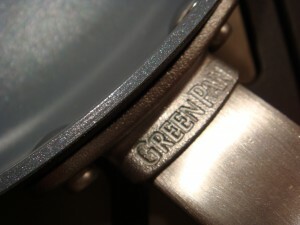 Next to these benefits, GreenPan (TM) actively reduces packaging material, printing ink and printing colours. Most raw materials used in production are recycled. Thanks to their ingenious design, the final product is easy. Well, I was already sold on how good they were for both the environment and our household… that was a no brainer… but would they work as well as traditional non-stick pans??? So I have had them now for about 3 months — we bought them right before Christmas. It was an impulse buy, so we didn’t do any research on them before hand re: consumer satisfaction. After the purchase, we read mostly positive reviews and a few negative reviews that specifically mentioned how the non-stick surface was great at first, but wore down after time and use. Immediately, I loved them. One thing you must do is heat the pan prior to placing the food in — which they do specify in the product details. The surface was ridiculously non-stick… I didn’t even need any non-stick spray before frying an egg. As of recently, I have been using the spray more, but I honestly believe it is because we are not cleaning them properly. The instructions specify that they can go in the dishwasher… though, I think they get a better cleaning by hand and tend to keep their coating best when washed by hand. I probably don’t even need the non-stick spray… it’s just a habit. We have not seen any peeling, chipping or scratching of the surface, though I have been carefully to only use plastic and wood utensils when stirring. We purchased the pans that have a black coating on the exterior… which has scratched a little. I tend to do a lot of “pan shaking” when cooking and my stove-top is cast iron… so it tends to scratch. These also come with a stainless exterior, which would probably hold up to constant use and wear and tear better. Even so, the exterior scratches don’t bother me… all I care about is that they are safe to use and remain non-stick. So far, so good… I definitely recommend these pans. You can buy them all over the place now. I saw them advertised at both Target and Crate and Barrel. I feel bad because all my beautiful stainless steel cookware is collecting dust! Non-stick is just so much nicer… especially when you can actually put it in the oven! We switched to the GreenPan for all our stove-top cooking. We changed our electricity plan so that 100% of our electric comes from alternative wind turbines (it only adds on like $20 or less a month). We are recycling more than 50% of our trash and have significantly cut back on our consumer waste by buying in buld and rationing out, rather than purchasing individual serving portions. We are buying more and more of our products locally and hope to participate in a CSA this summer. Now just to lose that damn weight!